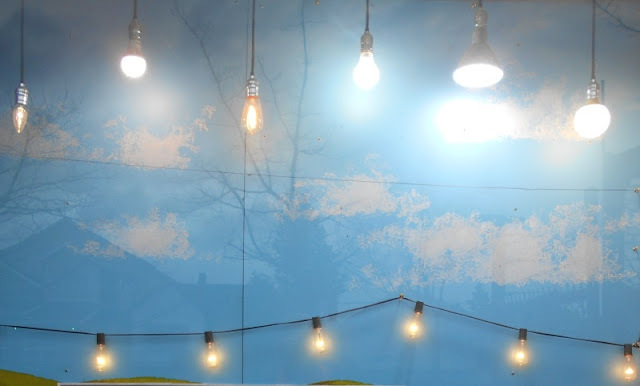 Editorials from Theslowlane: Are happy lights for Seasonal Affective Disorder the wrong color? Are happy lights for Seasonal Affective Disorder the wrong color? Because Bellingham has lots of dark cloudy weather, many local people suffer a form of depression called "Seasonal Affective Disorder." This is related to lack of sunlight. People often buy special bulbs called happy lights or full spectrum lighting which mimic sunlight, but I wonder if these bulbs are the right color? Looking at displays at the hardware store, the happy lights tend to be kind of blueish, sort of like standard florescent light. That could be the true color of the sun in space, but when we see the sun, it's often more yellow or even orange. When we see the sun, especially in winter months (if we see the sun) the light is coming to us from a shallow angle through earth's atmosphere so the atmosphere tends to filter out the colors making for a warm sunset or sunrise glow. Maybe happy lights would work better if they mimicked the sun at low angle since that's the sunlight we are evolved to see? The sun tends to be more blueish at high noon, but we tend to see it at lower angles through the atmosphere. In some countries, people take siesta at high noon. Shouldn't artificial sunlight that is designed to wake people up be more like the colors of sunrise? Maybe they've been doing it wrong all along. Maybe that's why lots of folks tend to be withdrawn around Bellingham in winter months. I'm glad I don't seem to be that effected by Seasonal Affective Disorder. Some useful comments I got when I posted on Facebook. Light therapy for Seasonal Affective Disorder does best with a light that is about 456 nanometers, which is on the blue side. I have one that uses blue leds and works well. I have a wake up light from Phillips that very smartly imitates the spectral envelope of sunrise; I think they do it with a mix of broad spectrum LEDs that are pulse-width modulated, since from what I understand that's a very flexible way to tune the spectrum. They definitely take into account the filtering effect of the atmosphere, although I don't think there is any simulated change of zenith angle across seasons. But that's actually not a very complicated calculation for a clock that already has the date anyway. This is a really interesting idea! I agree. bluish light makes me ill, warm dim bulbs make me happy. Get a light used for snakes and lizards at the fish store on Railroad Ave.
All they need do is spend some time in a place with drought under water restrictions, and they should feel a little better and more fortunate.